Found thisin the river. Here in colorado. 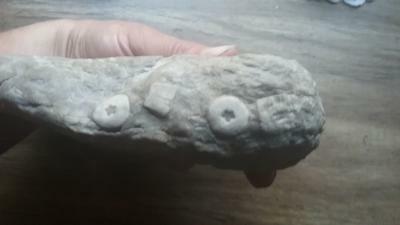 Dont know if its rare or not.any information you can give me would be nice.i know its a crinoid columnal. These are crinoid columnal. Crinoids are an ocean animal that looks like a plant. The sections on your rock are parts of the "stem" of that animal. They are a common fossil though I have not heard of them in Pagosa before. The rocks there are from the Cretaceous Period. Crinoids are considered a living fossil. They have been around for hundreds of millions of years and are still living in todays oceans.